We’ve talked before on this blog about the “fall clearance” issue. Essentially fall clearance has to do with the distance you need to account for when taking a fall in order not to hit the ground. What this means is that if you are 6 foot tall, wearing a 6 foot lanyard, accounting for stretch and other factors, you will need to have 18 feet off fall clearance as illustrated below. Because factors vary (You might be using a self-retracting lifeline or an 8 foot lanyard, for example) each application should be looked at separately and the fall clearance calculated for each instance. 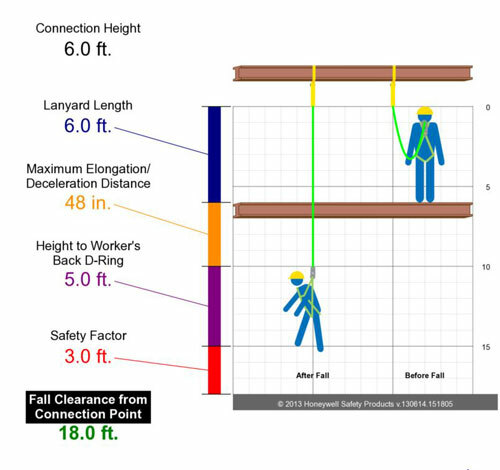 Fortunately, Miller Fall Protection has a fall clearance calculator that you can use to determine your fall clearance. Just type in your variables and it’ll give you your fall clearance, illustrated as in the above image. Great little tool to keep everyone safe! This entry was posted in Fall Protection and tagged calculator, distance, Fall, Honeywell, Miller, Protection. Bookmark the permalink.